Artem Lukyanenko and Ksenia Zhuk from NaviBand will represent Belarus at the Eurovision Song Contest 2017 with the song Historyja majho zyccia (Story of My Life). It is the first time that a song at this prestigious contest will be performed in the Belarusian language. The musicians consider it as a historic event and are very proud of this. They also take pride in the fact that the Ukrainian team, which in due time prepared Jamala and Zlata Ognevich for Eurovision, helps them. In an interview with an Ukrinform correspondent, the Belarusian musicians told about rehearsals in Kyiv and the second attempt to conquer the national selection, about a meeting with Jamala and the atmosphere of communication with other Eurovision participants. - Guys, you are in Kyiv, although official rehearsals at the Eurovision Song Contest 2017 have not yet begun. What has brought you here now? Artem: We are in Kyiv because the team of Ukrainian professionals assists us in preparing our performance: choreographer, director and stylist-designer. And it is the second time we come here for rehearsals – we were here a month ago. We will also shoot some small videos here. As we like to perform songs of other countries and now we try once a week to record different songs (mostly folk songs) and share them on the Internet. We’ve already had a song from Greece, we’ve sang an Israeli folk song, an Armenian song. Therefore, we have what to do here. But first of all, of course, these are rehearsals. - We read that NaviBand is a Belarusian band from Minsk, performing indie pop, folk rock, indie rock, indie folk songs... We saw you during our national selection. It was a very nice performance. But what kind of genre is it? Ksenia: Indie music means independent music. It's been popular lately. To be honest, we haven’t had a clear understanding of what to play, and we are not such guys who say: we will play specifically rock - and that's it! Artem: We like to introduce some folk tunes into more modern motifs. We find pleasure in it; we are imbued with our culture and traditions. - Are we talking about Belarusian tunes and traditions? Artem: Yes. We sing in Belarusian, and it will be the first time Belarusian will sound on the stage of Eurovision. It is very important for us to support our culture, our language. And in the song we perform, there are such tunes - hey-hey! - which the audience can sing together with us. Ksenia: In fact, the folklore of different peoples is very similar. Sometimes our friends-musicians sent some Scandinavian folk songs to us- and they were so similar to the Belarusian folklore... In general, we like all these folk stories, folk art. - We’ve read very warm comments from Jamala about your band. She has noted your energy, emotions, positive and she said: there is something that makes people listen to you. It has taken place just recently. Artem: Yes. It has taken place a couple of days ago. Jamala had a concert in Vilnius, and she gave an interview to the Minsk edition of Euroradio.соm. It was sent to us. We were pleasantly surprised. We thank her very much for such kind words! Jamala remembered your performance at our national selection. You made a surprise for her. Whom of our musicians at the Ukrainian national selection did you like? 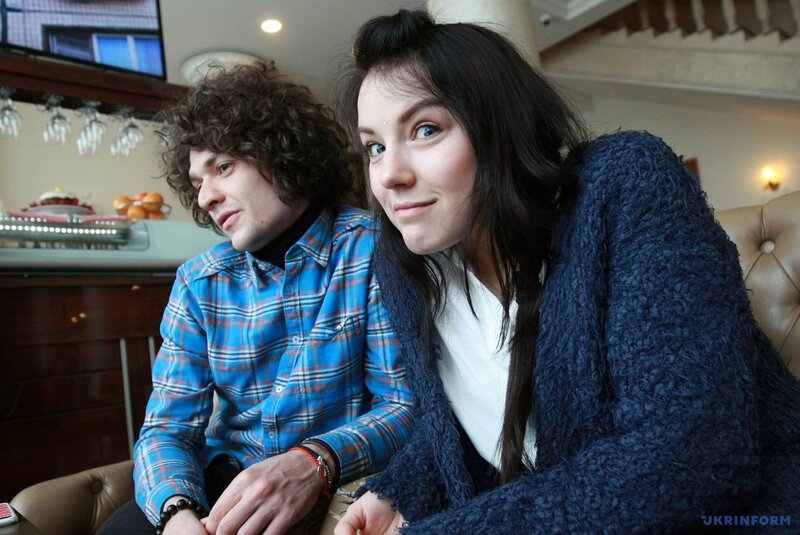 Ksenia: We really liked both O.Torvald, which then won, and Salto nazad - they are very cool! Artem: On the whole, we follow the Ukrainian artists because now there are a lot of wonderful musicians and the media space has grown incredibly. I mean both the authentic and pop culture, and rock music, and folk music. And all this is developing in a very right direction. That's great! Your musicians to some extent are trendsetters for us. Ksenia: Not so long ago, Alexander Tikhanovich from the Verasy band died. It is also a very sad story, because he did a lot for the Eurovision Song Contest in Belarus. In general, he supported many musicians, including us. - Was there a strong competition at your national selection, or did you win fairly easily? Artem: Of course, there was a competition. There was a struggle in the final ... I can only say that we are doing our work honestly. Last year we also reached to the final, but we were not lucky to get into the contest. Maybe it's good, because we had quite an active year of concerts and performances. - And how did you meet? Tell us about the history of your band. Artem: It was four years ago, it was accidentally. Ksiusha and I just met to create a song. Everybody in Belarus liked the song. We began to give concerts; people began to come to our concerts. And now we have the real band, including other musicians. We travel, we give concerts, and we make a living from our songs. Tt became a deal of our lifetime. - Representatives of 42 countries will meet in Kyiv. There will be no representative from Russia. Do you know about this situation? What do you think about it? Ksenia: Our main position in our art and in life as well - not to deal with any political aspects. To be honest, I don’t know much about all these stories. - Okay. On April 30, Kyiv will officially open the Eurovision Week and delegations will start arriving. When will your band arrive? Artem: We will arrive on May 1. We will have the first official rehearsal in Kyiv on May 3. … As the Belarusian media writes, there will be a new arrangement, new images, new staging. Will there be any surprises? Artem: Our arrangement will remain the same. We’ve just added a little development in the final part. The most important thing that will be in performance is the relationship between us and the Belarusian language! The most important thing is our song and our eyes for the viewer! This is what we want to bring to the viewer. All the rest is just an addition. The director's group of Jamala and Zlata Ognevich are preparing the performance. The intrigue is that we will fly. But how and with the help of what we will fly, and how this will take place - you will see during the performance! - Well. So, on the stage of Eurovision you will perform in the second semifinal on May 11, under number 14. Are you self-reliant, are you prepared? - I sincerely wish you success!